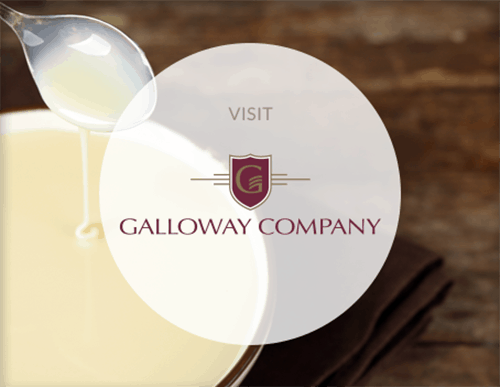 At Galloway Company, we are constantly striving to do better. If our customer needs a product not currently in the product line, we’ll develop it, or do our best trying. If there is a way to make a process simpler, faster or less expensive, we challenge ourselves to find it and improve upon it. If a piece of equipment needs to be modified or developed, we’ll do it. Our desire to consistently challenge the status quo sets us apart from other dairies. Because of this passion for innovation, our team’s skills go beyond production of fresh dairy products. A significant portion of our workforce is committed to developing and refining technological advancements. Our team of engineers, R&D and IT professionals, and maintenance personnel take on unique and difficult projects. When it comes to our products, we strive not only to make the best products, but to make the exact product a customer needs. Our product innovations have helped customers enter new markets and expand product lines, make a finished product more efficiently, and improve the taste and texture of existing products. We invite you to challenge us with a product request. If you can dream it, we will do our best to make it! Innovation is in our DNA. And, while the need to adopt processes and develop equipment derived from a problem we were trying to solve for ourselves or a customer, others have taken notice. 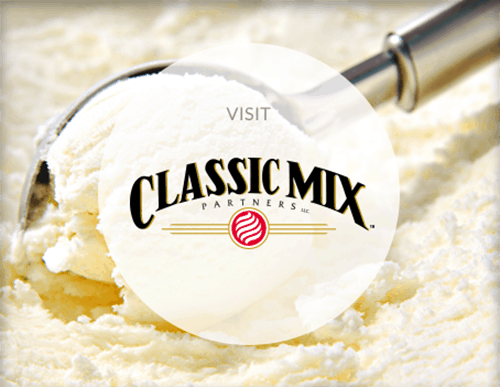 Many of our innovations have been adopted within and outside the dairy industry, from the 1950s to today. Galloway Company developed a system for liquefying dry sugar from rail cars without the need for expensive material handling equipment. This eliminated the need for bulky and expensive pneumatic conveying systems that were the standard up until then. It has been widely adopted by companies unloading rail cars of sugar. Galloway Company installed the first falling film evaporator in the United States designed specifically for manufacturing sweetened condensed milk. It has been modified and upgraded so that today it produces more than twice its original design specification. At the same time the evaporator was installed it was paired with a state-of-the-art DCS (Distributed Control System). This was done in anticipation of implementing full factory automation. Today, the entire manufacturing process is controlled by a fully redundant DCS over a redundant fiber optic network. This allows control of any process from any computer in the factory or even from remote sites. When loading product into tank trucks, the same valve must be used to both fill and empty the truck. This means that when the truck reaches the customer, the tank valve is not truly clean. Galloway Company invented a portable valve washer that can automatically CIP (Clean In Place) the truck valve. We have provided units to numerous customers for their internal use. Most of the milk Galloway Company receives is heat-treated, separated into cream and skim milk, and the skim milk is then concentrated via reverse osmosis. This extends the shelf life of the milk, reduces energy consumption, and optimizes tank utilization. Since all of the products manufactured by Galloway Company are concentrates of some form, it permits the removal of water in the most energy efficient manner. This is a unique design that permits effective cleaning of headers on the back of hookup panels without the need for valves. It eliminates dead spots and keeps cold, fresh product flowing pass all points. Anywhere a positive pump or homogenizer is used, there is a potential for a closed valve down stream to cause a pipe or fitting to burst. On a pasteurizer it is almost always the plate heat exchanger that blows apart. The normal solution would be to install a pressure relief valve. Unfortunately no company manufactures a sanitary, full open, pressure relief valve. Galloway Company has developed a quick, full open pressure relief valve that utilizes the direct pressure in the pipe to open the valve fully in less than a half second. This design permits the manufacturing of very concentrated and therefore viscous products on our mix pasteurizer, with mixes in the 40% total solids range and Sorbet into the 60% range. We use a cascade control loop to transition between low viscosity water, which requires backpressure, and high viscosity products, which required pressure attenuation. Vertical tanks with vertical turbine style agitators will provide optimum agitation for many products. However, as tanks become larger, it is increasingly expensive to place them indoors. The normal solution is for very large dairy tanks to be alcoved into the side of a building. However, all regular alcove dairy tanks employ a pitched bottom design that does not work well with turbine agitation. Our design permits dished bottom tanks to be alcoved into the side of a building, with the tank located outdoors. 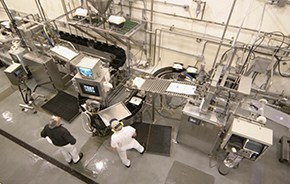 Galloway Company has installed a unique processor that is government certified to operate in three completely separate modes: HTST, HHST, and High Acid Aseptic. This flexibility is a hallmark of Galloway Company’s manufacturing expertise. In order to CIP (Clean In Place) a piece of equipment, it is necessary for there to be a physical break between the CIP system and the processing equipment. This prevents cross contamination between product and chemicals. However, this prevents having multiple machines hooked up to clean sequentially. 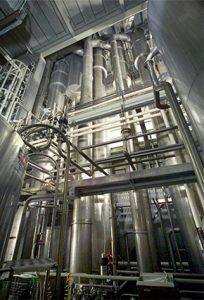 Galloway Company uses multiple CIP skids connected to various equipment zones via mix-proof valves to achieve a higher level of automation and throughput. We also use magnetic flow meters rather than metering pumps to verify actual chemical dosage. Our process panel permits processing from any tank farm to and from either pasteurizer, while making cross-connections between raw and pasteurized product physically impossible. Traditionally, dairy tank alcoves have been small and elevated. This gives the operator a very small space in which to work. All new alcoved tanks at Galloway Company are eight foot square with no step up, permitting the operator to easily work in and around the tank. Most processors that run multiple SKU’s through a single processor will run them back-to-back. This means there is always some commingling of different products. Galloway always has water in between each SKU to guarantee complete product separation. To minimize product loss, we create characterizing curves for each product and calculate the amount of water to withhold. Galloway Company has developed a unique tank agitator design that permits the thorough mixing of high viscosity products with no whipping. Our separator and reverse osmosis systems are fully automated permitting them to operate without an operator being present. In the event of a fault, the system is capable of shutting itself down and calling an engineer. This system permits concurrent blending from any tank farm at Galloway Company to multiple processes concurrently. This automates and simplifies the process of sharing tanks. It has the added benefit that it scales linear rather than as a second order polynomial. Many evaporators require multiple passes on a single effect in order to achieve thermodynamic, hydraulic, and vapor balance. We have developed a method for doing this with just one pump and advanced control. Each time a piece of equipment is washed, the first rinse water will usually contain some dairy residue. All CIP systems at Galloway Company discharge to a central location where the effluent is independently monitored for opacity. If the effluent is sufficiently milky, it is segregated in a holding tank, cooled, and transferred to a larger tank where it is hauled away for land spreading. This is a new style of coriolis meter that has the ability to compensate automatically for process variations. It provides very precise metering in high-speed packaging applications. Galloway Company achieved and eight-fold improvement in fill accuracy over an older style of coriolis meter. Some products manufactured by Galloway Company require varying amounts of heat treatment. The traditional way to handle this was by adding or removing one or more dedicated regeneration sections. However, these offer only all-or-nothing temperature control. We have developed a method for achieving variable regeneration. This offers a much more precise level of control and much simpler operation. Let Galloway Company help you produce a better product more efficiently. If you would like to know more about how our innovative team can help you, contact Galloway Company, or call 920-722-7741.